“Nobody in Africa, but yours truly, can get a good head of steam on the old African Queen.” The original boat used in the classic 1951 movie, The African Queen – which was directed by John Huston and starred Humphrey Bogart, Katherine Hepburn and Robert Morley – is docked in a canal that lies adjacent to the Holiday Inn Key Largo (Mile Marker 100). Built in Lytham, England, in 1912, and once used by the British East Africa Company in the Belgian Congo, the steamboat was renovated and made seaworthy once again in 2012 (at a cost of more than $75,000) by a Key Largo couple who own a charter boat company. Bogart’s son, Stephen, who lives in Naples, Florida, participated in the re-launch party, which took place on April 12, 2012, the 100th anniversary of the sinking of the Titanic. Once owned by actor Fess Parker – best known for portraying both Davy Crockett and Daniel Boone – the African Queen ended up decaying in an Ocala horse pasture before being bought in 1982 for $65,000 by an attorney, who relocated the boat to Key Largo. The African Queen is currently available for two-hour canal cruises several times daily, as well as six-passenger dinner cruises on selected nights. Built by 1851 by Asa Tift, a captain and ship’s architect, the house (the single largest residential property on the island) was bought by Ernest “Papa” Hemingway and his second wife, Pauline, in 1931 at a cost of $8,000 (it was actually a wedding gift from Pauline’s wealthy uncle, Gus). The couple lived there with their two sons, Patrick and Gregory (Ernest divorced Pauline in 1940 and married Martha Gelhorn three weeks later). Hemingway reportedly wrote the final draft of A Farewell to Arms, as well as classic short stories such as “The Snows of Kilimanjaro” and “The Short Happy Life of Francis Macomber,” at the house. He created a writing studio in the second floor of a carriage house on the property that was connected to the master bedroom by a walkway. A boxing aficionado, Hemingway built a ring in the backyard where he often sparred with local fighters. An in-ground, saltwater pool was added in 1938 at a cost of $20,000. Hemingway hired his friend and handyman Toby Bruce to build a high brick wall around the house as privacy from tourists anxious to catch a glimpse of the famous writer. Hemingway also hauled away a urinal from Sloppy Joe’s Bar to the house and turned it into a fountain in the yard. Approximately 40 to 50 polydactyl (six-toed) cats currently live on the grounds of the Hemingway Home. According to legend, the cats are descendants of Hemingway’s own six-toed cat, Snowball (however, Patrick has denied that his father owned any cats in Key West, only at his residence in Cuba, Finca Vigia). Designated a National Historic Landmark, the Ernest Hemingway Home is located at 907 Whitehead Street (across from the Key West Lighthouse). Grassy Key in the Florida Keys is home to the Dolphin Research Center (Mile Marker 59, Gulf Side), which also serves as the final resting place for the original “Flipper” (real name: Mitzi). In the early 1960s, the Dolphin Research Center was known as Santini’s Porpoise School (founded by Milton Santini, a pioneer in dolphin collection and training) with Mitzi (born in 1958) as its first pupil. Mitzi appeared in the movie Flipper (1963), which starred Chuck Connors, Luke Halpin and Kathleen Maguire, as well as a 1964 sequel, Flipper’s New Adventure. Ricou Browning, who portrayed the underwater Gill-Man in Creature from the Black Lagoon and its sequels, co-wrote the film with Jack Cowden. A male “stunt dolphin” named Mr. Gipper actually performed Flipper’s tail-walking tricks in the films. Mitzi died of a heart attack in 1972 and was buried under a dolphin statue in the school’s courtyard with a small plaque that states: “Dedicated to the memory of Mitzi, The Original Flipper, 1958-1972.” After Mitzi’s death, Santini sold the school to an entertainment conglomerate that renamed the attraction to “Flipper’s Sea School.” Established in 1982, the Dolphin Research Center is open to the public and home to Atlantic bottlenose dolphins and California sea lions. The largest all-masonry fort in the United States, Fort Jefferson (named after Thomas Jefferson) was constructed with more than 16 million bricks between 1846 and 1875 on Garden Key, which lies approximately 70 miles West of Key West. A federal outpost during the Civil War, Fort Jefferson held more than 500 prisoners by 1865 and in July of that year added Dr. Samuel Mudd, Edmund Spangler, Samuel Arnold and Michael O’Laughlen – all of whom had been convicted in the assassination of President Abraham Lincoln. Mudd was eventually pardoned by President Andrew Johnson after treating the victims of a yellow fever epidemic at Fort Jefferson in 1867. The Prisoner of Shark Island (1936), which starred Warner Baxter and Gloria Stuart, was loosely based on the life of Mudd. In 1935, President Franklin D. Roosevelt designated the area as Fort Jefferson National Monument and the fort was listed on the National Register of Historic Places in 1970. Fort Jefferson lies within the 64,701-acre Dry Tortugas National Park, which is accessible only by boat or seaplane. Established in 1847, the 19-acre Key West Cemetery features a monument that was dedicated in 1900 for sailors who died during the sinking of the U.S.S. Maine (which blew up in Havana Harbor in 1898, killing approximately 260 American sailors), as well as a number of eclectic inscriptions such as “I Told You I Was Sick,” “I’m Just Resting My Eyes” and “Devoted Fan of Julio Iglesias.” In addition, the cemetery contains the graves of “General” Abe Sawyer, Key West’s famous 40-inch-tall midget, who had requested to be buried in a full-size tomb; William Curry, who was reportedly Florida’s first millionaire; Stephen Mallory, a U.S. Senator and Confederate Navy Secretary; and Ernest Hemingway’s good buddy, “Sloppy Joe” Russell. Housed in a Civil War-era fort with eight-foot-thick granite walls, the Fort East Martello Museum & Gardens contains a unique collection of artifacts, including the scrap metal junk sculptures of Stanley Papio, the Key West folk art of Mario Sanchez and, perhaps most famously, Robert the Haunted Doll, which once belonged to Key West artist Robert Eugene Otto (when in doubt, “Blame it on Robert!”). Other highlights of the museum include artifacts from the Florida East Coast Railroad, sponge industry and much more. An engineering masterpiece, the Seven Mile Bridge (which is actually 6.79 miles long) was constructed between 1979 and 1982 on the Overseas Highway at a cost of $45 million and serves to connect the Middle Keys (Marathon) to the Lower Keys (Little Duck Key). 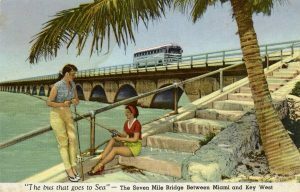 Each April, the bridge is closed for a couple of hours for the Seven Mile Bridge Run, an annual event that began in 1982. Movies filmed over the years in the vicinity of the bridge include True Lies, 2 Fast 2 Furious, Licence to Kill, Criss Cross and Up Close & Personal. Outlaw country music singer David Allan Coe wrote a song titled “Seven Mile Bridge.” The bridge, which replaced a much narrower roadway built atop the remains of Henry Flagler’s railroad bridge, can reportedly withstand winds of up to 200 miles per hour. An immense buoy-like structure that was erected by the City of Key West in 1983 at the corner of Whitehead and South streets supposedly marks the “Southernmost Point in the United States,” which is approximately 94 miles North of Cuba. The “Southernmost Point” was previously designated simply by a sign that often got stolen. Located just a short distance from the Ernest Hemingway Home & Museum, the Key West Lighthouse and Fort Zachary Taylor Historic State Park, the buoy is one of the most photographed sites in Key West. Several street vendors usually hawk their wares near the buoy. However, Florida’s official Southernmost point is actually Ballast Key, a privately owned island located Southwest of Key West. A lively festival that takes place nightly at Mallory Square Dock, Sunset attracts a variety of colorful acts, including Will Soto, a legendary juggling and high wire act; Dennis Riley, the “Southernmost Bagpiper”; The Great Rondini, escape artist; Dale the Sword Swallower; Dr. Juice, “The Calypso Tumbler”; Dominique the Cat Man; and many others. According to legend, it was actually Tennessee Williams who started the whole ritual of celebrating the Key West sunset (a glass of gin and tonic in his hand, of course). During the late 1960s, hippies high on LSD would descend upon Mallory Square each night. In the 1980s, legendary Sunset participants including Love 22, Featherman Louie and the Cookie Lady banded together to help form the Key West Cultural Preservation Society, which continues to manage the Sunset Celebration.